Before he resigned, former EPA Administrator Scott Pruitt, backed by his chemical industry allies, proposed a rollback of lifesaving regulations that protect communities from chemical and industrial explosions, fires, gas leaks, and oil spills. Everything we know about Acting EPA Administrator Andrew Wheeler indicates that he will continue to champion this reckless pro-polluter plan. We can’t let Trump, Wheeler, and their big polluter cronies push this through. Call on the EPA to reject this dangerous rollback plan and protect our families from the threats of chemical and industrial facilities. The public comment deadline was extended to August 23rd, so send in your comment today! Before he resigned, former EPA Administrator Scott Pruitt, backed by his big polluter backers and Trump, proposed a rollback of lifesaving regulations that protect communities from chemical and industrial explosions, fires, gas leaks, and oil spills. Everything we know about Acting EPA Administrator Andrew Wheeler indicates that he will continue to champion this reckless pro-polluter plan. We can’t let Trump, Wheeler, and their big polluter cronies get away with this. Call on the EPA to reject this dangerous rollback plan and protect our families from the threats of chemical and industrial facilities. 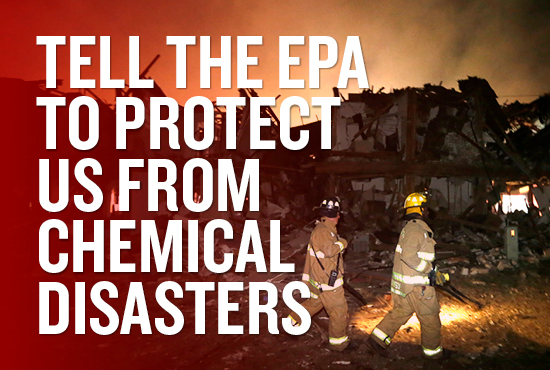 Dear Acting Administrator Wheeler: I urge you to reject former Administrator Pruitt's proposal to roll back vital components of the EPA's Risk Management Program (RMP) rules that protect communities from chemical and industrial explosions, fires, gas leaks, and oil spills. We've already seen what happens when these critical rules aren't as strong as they could be. The tragic ammonium nitrate explosion in West, Texas, in 2013, killed 15 people and injured hundreds. Between 2004 and 2013, over 2,200 chemical disasters took place in the US -- killing 59 people and injuring over 17,000 more. The EPA estimates that roughly 150 of these tragedies take place per year, and there have already been 46 incidents so far in 2018. The dangers associated with these hazardous facilities fall disproportionately on low-income communities of color, or environmental justice communities. And as climate change increases the risk of extreme weather, these incidents could happen even more often. Last year, a chemical plant outside of Houston exploded after being destabilized by Hurricane Harvey -- emitting noxious fumes and smoke beyond a 1.5-mile radius, and leaking toxic chemicals into the storm waters. Protecting first responders, workers, and the lives of 134 million Americans living near dangerous chemical facilities should NOT be a partisan issue. Your predecessor and President Trump proposed this rollback to protect their chemical industry allies, not the American people. I urge you to begin your tenure at the EPA by reversing course and protecting our families from the threats posed by chemical and industrial facilities. Please reject the Trump administration's misguided and dangerous proposal to roll back lifesaving RMP regulations. Thank you.